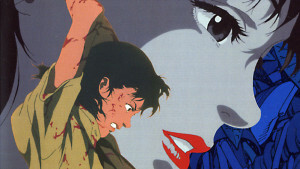 Perfect Blue Ultimate Edition details. Pre-order this 29th April 2019 release today!. Hello one and all! It's been a long time since we brought it up in conversation and we know a lot of you have been eagerly awaiting details on our Ultimate Edition of Satoshi Kon's classic film, Perfect Blue. Well, today is the day you've been waiting for, as we've got a whole lot of information to share with you. Oh, and you can even go and pre-order the product right now! However, let's not get ahead of ourselves, so read on below for all the details. Synopsis: "Mima Kirigoe is ready to leave her career as a pop idol behind and forge ahead towards a bright new future as an actress. However, casting aside her former image proves to be far more difficult than she imagined, and the murky world of show business threatens to drag her into the depths of despair. As the strains of her new career path take their toll, and a menacing presence from her pop star past lurks in the background, is Mima able to keep a firm grasp on the things that define her? And as delusions, fiction and reality blend together in her mind, just what is it that defines her anyway?" A BRAND NEW REMASTER OF THE FILM! 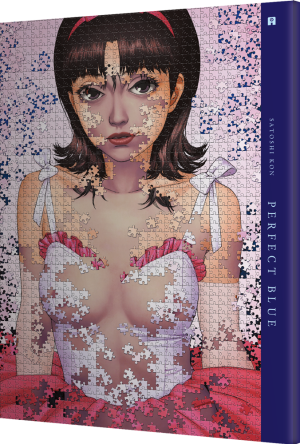 We've released Perfect Blue in the past on Blu-ray - in fact it was one of the very first titles we (Anime Limited) released way back in 2014 - but this Blu-ray is different as it's a brand new remaster of the film! This remaster - which you won't have seen in any cinema or other home video release before - improves on the overall visual quality of the film, giving you a new viewing experience that really show off its direction and composition as is befitting of such an important film. If you're new to the film or want to see a little more of this new remaster in action, check out our remastered trailer for Perfect Blue, that exclusively uses footage from this brand new remaster of the film! WHAT'S IN THE ULTIMATE EDITION? As we talked about above, you will get this brand new remaster of the film on Blu-ray! Language options include the English dub of the film (in 5.1 audio), the original Japanese mono audio and a brand new Japanese 5.1 audio option! Of course you also get English subtitle options to accompany the Japanese audio, and a "Song & Signs" track to accompany the English audio. But that's not all, oh no no no! We've got loads of extras for you! We're not just saying this, but we're sure you're going to get a kick out of watching these, and learn something new about the film in the process! If that wasn't enough, again adding to the definitive nature of this release, we've even included the original standard definition version of the film (in Japanese mono with English subtitles), the English version of the song "Angel of Your Heart" and our very own UK trailer on the disc as well! We're included a 48-page soft cover A4 sized book (pictured right) that will show you artwork, layouts, rough sketches, character designs and also comments and notes taken from series of lectures in Japan featuring Satoshi Kon that add more great information about the film. The book includes some fascinating imagery and insight into the film. This book has been translated into English and has never received a release outside of Japan! 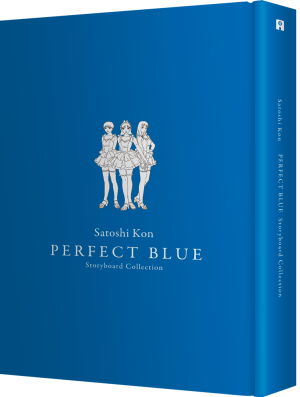 384-page Storyboard Book: "PERFECT BLUE STORYBOARD COLLECTION"
Now, we come to something we are incredibly proud we have the opportunity to bring to the west for this Ultimate Edition release, the Perfect Blue Storyboard Collection (pictured left). This book is literally the entire film in storyboard form! You'll get to see how the film was mapped out in its entirety by the director, and you could even watch the film and use this book as a reference guide at the same time if you wanted. Additionally, you can even see in an untouched form the vast array of notes in Japanese from director Satoshi Kon himself throughout the book. This collection of storyboards was originally released in Japan across three A4 books, but we've combined them all into a beautiful, mammoth, 384-page hard cover A4 sized book! This includes storyboards for the entire film as we mentioned, as well as some deleted scenes, too! Satoshi Kon and his work is something that is treasured immeasurably by those who worked with him and those who continue to preserve his work. This collection has never been released outside of Japan and we are truly honoured to be able to include this in our Ultimate Edition. We know it's something that people looking through it will have a great time exploring as well. Given the contents involved, the two books will be stored inside a rigid slipcase. (And to confirm, as the two books are A4 sized, the the rigid case is A4 as well.) The two discs (the Blu-ray and CD) will be stored inside the storyboard book itself. There's a holder for the discs on the inner side of the front and back covers. The holders have been constructed to be part of the book itself, rather than an additional part attached to the book, to ensure that everything is stored safely and securely. You can see how the front (pictured left) and back (pictured right) of the rigid case look in the two images we have here. And that, ladies and gentleman, is what will be included in our Perfect Blue Ultimate Edition release! We know some of you may have some questions about what we've revealed above, so make sure to you scroll down to the end of this post as we have an FAQ that will likely answer some (and hopefully all!) of those questions. Now for another crucial bit of information. First of all the release date. We're happy to confirm that this Ultimate Edition will be released on Monday, 29th April 2019. When it comes to price, given the nature of the contents, the SRP of this Perfect Blue Ultimate Edition is £99.99. At this time, the product will be exclusive to our own AllTheAnime.com store, as well as our friends and partners at Zavvi, who will also be offering this set for pre-order and purchase. 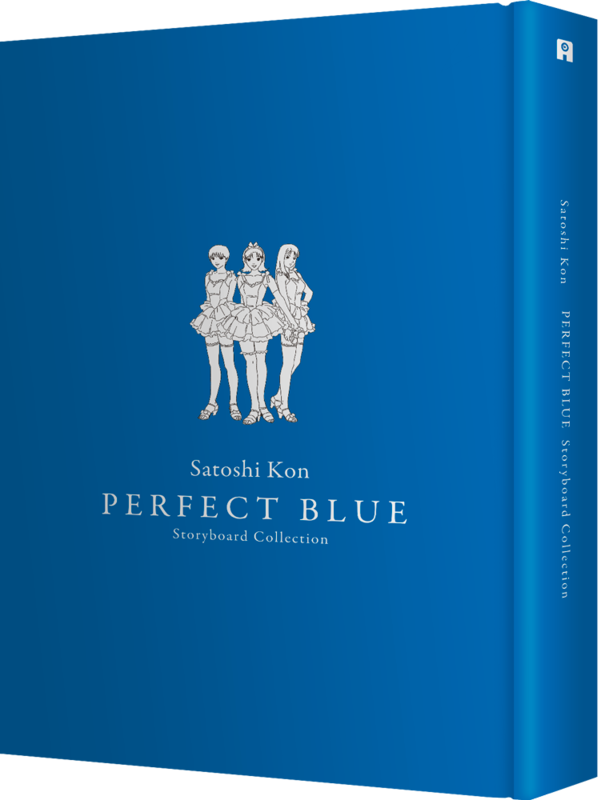 With that information in hand, we can reveal that pre-orders for this Perfect Blue Ultimate Edition are open right now!! What's more, we're selling this title at a reduced price of £89.99 - a price available to you regardless of which retailer you'd prefer to order the product at. Chance are there'll be some questions you have above all the information we've mentioned above, so here's a handy Frequently Asked Questions section for you. -- What are the language options for the new remaster of the film? Audio: English 5.1, Japanese mono and the new Japanese 5.1 mix. -- Has this new remaster of the film altered the aspect ratio? No, this has been retained from its original theatrical presentation. -- Will a DVD be included in this release? No, this release of the film will be Blu-ray only. -- How heavy is the entire product? -- What are the dimensions of the product? The rigid case (within which the contents reside) is approximately 21cm width x 30cm height x 4.5cm deep. -- Will the remaster of the film be released separately by you? At the time of writing, there are no plans for this. -- Why is the Storyboard book not translated into English? 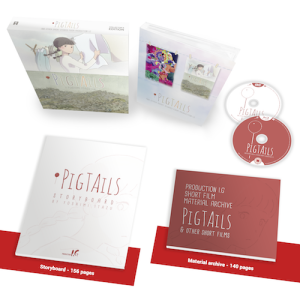 While we originally announced our intention to translate this book fully into English, as we mentioned earlier in this post the people who worked with Satoshi Kon along with those who are preserving his work want to take the utmost care when it comes to any of his works. Because they quite rightly want to project his legacy, it was decided that no changes were allowed to be made to the text and comments written by the director himself, and in turn no translation of the book was permitted. However, we still feel that this book is an immensely valuable addition to appreciating the film that fans of anime, and Mr. Kon's work, will love and appreciate. -- Why no soundtrack on vinyl? -- Will the CD soundtrack be available separately? No. The reason being that this soundtrack CD has been licensed to be included in this Ultimate Edition release specifically. -- How many units of this Ultimate Edition are being produced? 1000 units of this Ultimate Edition are being created. -- But I only want to buy the books? At this time we can say there are plans afoot to release the books without the discs included at some point in the future, but we have no other details we can share on that at this time. That said, as we've mentioned this is a brand-new remaster of the film that's not been included in any previous release, and it does include extras unavailable on our previous Blu-ray release. -- Do you plan to screen the new remaster in cinemas? There are no plans as things stand, but if that were to change we'll be sure to make it known. -- What region is the Blu-ray? The Blu-ray is locked to Region B. -- Will this Ultimate Edition be exclusive to any one retailer? At the time of writing, this edition is exclusive to both the AllTheAnime.com online store, and Zavvi.com. So, now you've seen how it looks and the vast amount of content it has to offer, how are you feeling about our Perfect Blue Ultimate Edition? If you're as excited about it as we are, then be sure to let us know, and don't forget that you can pre-order it this very second in advance of its 29th April 2019 release date! Greetings one and all! Yes, I know what you're all thinking... "Oh yeah, Anime Limited used to do new release posts all the time, when was the last time we saw one of those?" And yes, you'd be right to ask that, as we've been decidedly lax in dropping you reminders of our latest releases in this for quite a while - much like going to the gym and all of the best habits, it's a hard one to keep. But here we are, dusting off our best trainers and getting down to some mental gymnastics back on the New Release news post train, so join us as we take a look at this week's new release, as well as a reminder of another recent (and long-awaited) title that you may have missed. Without further ado, let's jump on the new release treadmill! 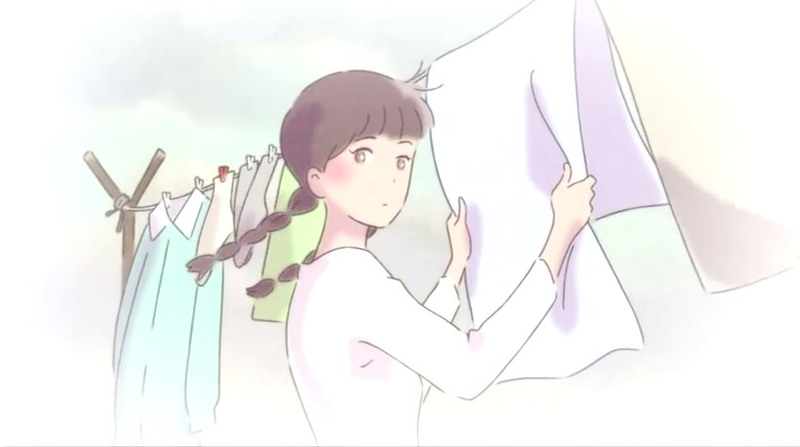 Synopsis: “After moving from Tokyo to a small seaside town, 15-year-old Futaba is captivated by the ocean views and the vast expanse of water which she finds laid out before her. Unbeknownst to her, Futaba’s fascination is shared by Hikari, who has lived in the town her entire life, and the two girl’s lives intermingle unexpectedly when the introverted Futaba meets the outgoing and exuberant Hikari as one of her new classmates. Contents: Contains the complete series (12 episodes) plus the OVA episode 13 in Japanese with English subtitles. On-disc extras consist of textless opening and closing animation, plus seven "Dive into Seaworld" shorts. Why not buy the series right here, right now from our own AllTheAnime.com web shop? As well as this new Blu-ray Standard Edition, you can also still purchase our Blu-ray Collector's Edition, which also features a 50-page hardback art book, two sheets of fun stickers, and Collector's Edition packaging. Contents: This set comes packed in a rigid case with a digipack to store the two discs. In addition to that two books are included! First there's the 156-page Pigtails Storyboard Book that has been translated into English! Giving you some fascinating insight into the creation of the short film. And then we also have the 140-page Material Archive! This book gives you information and imagery relating to all the shorts included in this set. You will get an overview of each along with background information on the director, staff and cast of each. And there's even character and background art from each short film as well. 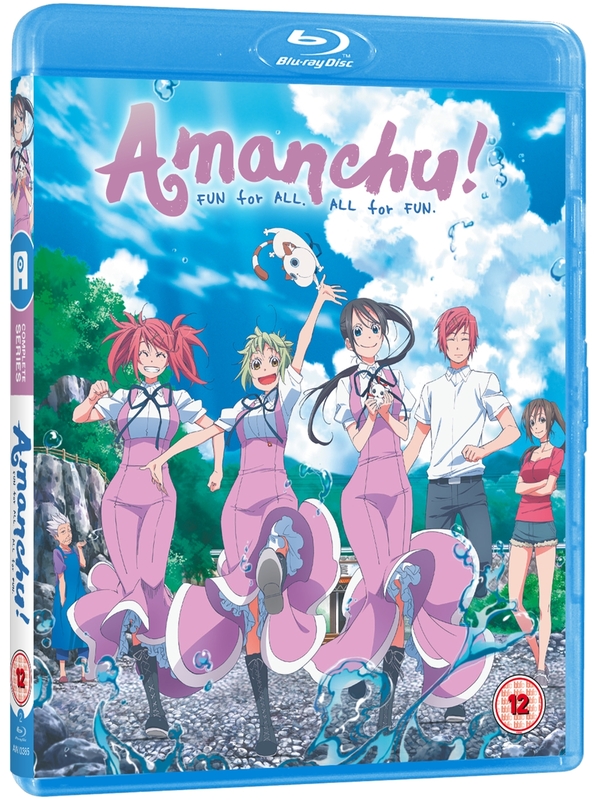 Our sumptuous Collector's Edition of this release is actually an exclusive product at our AllTheAnime.com online store - you can pick up a copy right now (alongside our Standard Edition Blu-ray/DVD release) right now below. - Check out video and photo unboxings of our glorious Collector's Edition! So there you have it - whether you're looking for fun and frolics exploring the ocean, or an incredible smorgasbord of animation talent, we've got just what you need! 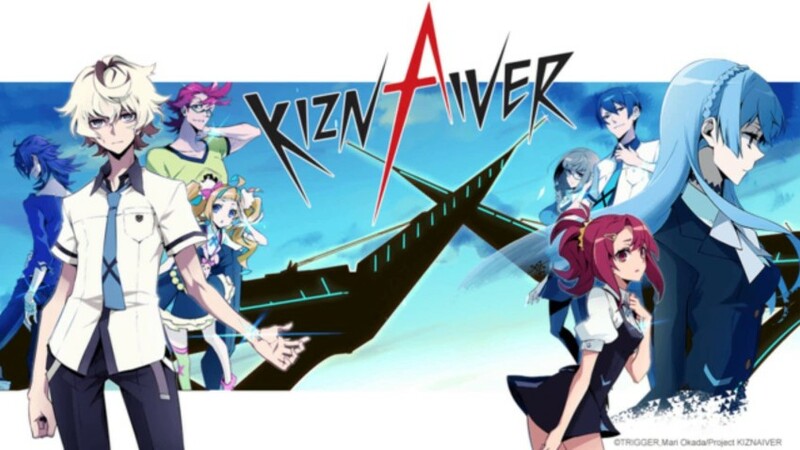 We'll be back next Monday as Kiznaiver comes to Standard Edition Blu-ray, so we'll see you then! Scotland Loves Anime in 2016 welcomed a first-time guest to Glasgow, Japanese animator and director Yoshimi Itazu. Since 1998, Itazu has worked on a wide range of anime, including such classics of the 2000s as Paranoia Agent and Denno Coil. On the period feature film Miss Hokusai, Itazu was both the character designer and supervising animator. In her new book, Animated Encounters: Transnational Movements of Chinese Animation 1940s-1970s, Daisy Yan Du argues against the way that Chinese animation wants to see itself, so often presented as an entirely local, inwardly focussed realm that pays no heed to foreign markets. 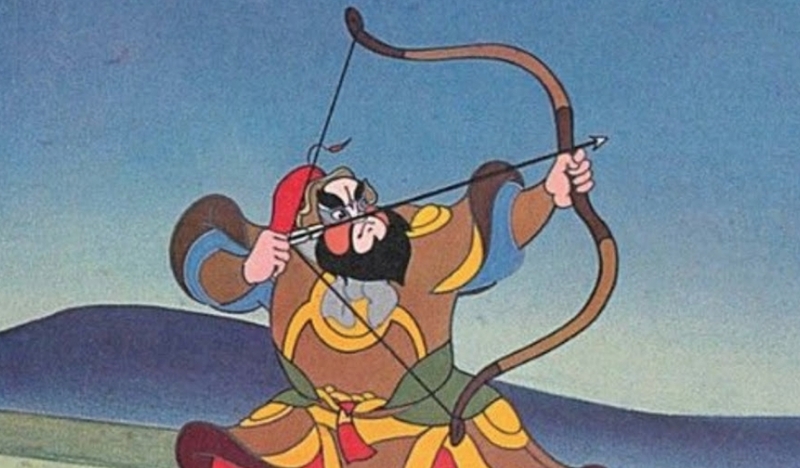 Particularly in the period under study, you might be forgiven for thinking that Chinese animation was limited largely to curiosities at a few Eastern bloc film festivals, as well as dour propaganda cartoons. But Du swiftly wins the reader over with her presentation of a rich field for collaboration between artists from multiple countries, along with surprising accounts of foreign investment and influence.